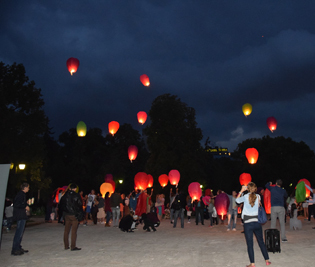 Tenths of Lanterns went to the sky over Sofia on September 24 2015 to send the messages and wished for better future of the Planet Earth. 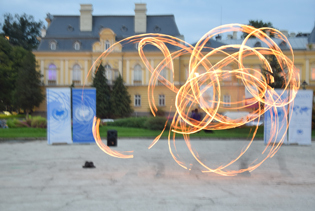 The Event organized in the garden in front of the National Theater was part of the Global Campaign Light the Way to promote the UN SDGs. The organizers in Sofia-Bulgaria were Gender Education, Research and Technologies foundation (GERT), the Global Initiative on Psychiatry (GIP), The UN Association and The Bulgarian Platform for International Development (BPID). Installation with candles, wishes, fire show and lantern show and a lesson of dance were only part of the accents of the show. 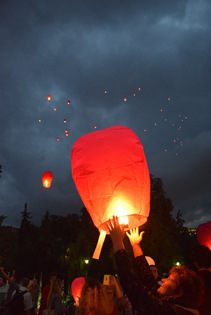 The event ended with lightening of 100 lanterns that went high in the night sky over Sofia. Today, the 25th September in the UN (New York) the World leaders will adopt the 17 global sustainable development goals, among which are the eradication of poverty, ending hunger, ensure quality education for all, decrease inequalities, responsible consumption, and stop climate changes. The SDGs are a historical opportunity to create a better future for all of us. The Event was possible thanks to the support of the Center for Coordination of the Air Traffic.